It was as if March got the memo regarding how to come in like a lion. On March 1st at about 2:30 am the winds picked up. And by ‘picked up’ I mean furious gusts relentlessly wind-whipped our little cabin and threatened to drop a giant cottonwood tree on top of us. For hours. No sleep was had. And during that time, I really did try to be exhilarated by its power, but instead I felt anxious and annoyed by its persistent, chaotic and overly aggressive behavior, because… 2:30 am. Was such an irritatingly grand entrance necessary? But now that March is here, I at least have an excuse to indulge in aquamarines. These are gorgeous stones from the beryl family and the birthstone of the month. I do love them so! The translucent, deep, blue varieties from Brazil are stunning. And so are the tranquil, watery, greenish-blue and teal colored stones, found in the moss aquamarine variation. So, I’ve been busy. In the Rodeo Of Jewelry-Making, I’ve been the wire wrestling, beryl racing queen! 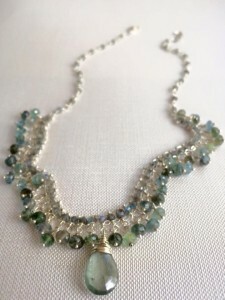 You can browse and enjoy the selection of available aquamarine and other jewelry here. Wait a second… I’m fashionable… Right?